Let’s start with the most expected and the most beneficial function - Multi-store management. This option provides Internet merchants with opportunity to run several absolutely different stores from one back end. This feature makes PrestaShop more competitive in eCommerce industry, as despite of other PrestaShop pros the absence of this function discouraged big companies to use the platform. Now with this new functionality, upgraded multi-currency and multi-lingual features there won’t be any borders for large scale business to use PrestaShop. Back Office has been redesigned and improved. PrestaShop developers improved usability that is why back end now is even more user-friendly and very easy to customize. Store front has also been enhanced. Now customer experience will become even more positive since order and checkout processes were simplified. Layered navigation and updated product search tool made store browsing easy and intuitive. Each store owner will be glad to hear about new After-Sales service tool. This feature will gather all feedback and messages from clients in one tab on your store’s back end. So, you will be able to handle all your client’s issues quickly and be sure that you didn’t miss any notifications. New modules API will automatically search for new updates and you will always have the latest versions of your extensions. Inventory management system was also improved significantly. Now you will be able to discern your physical stock and available quantities. You are also provided with opportunity to manage inventory in different stores. PrestaShop will now also support new payment and shipment gateways like Klarna, Allied Wallet and Kiala. With all these features including multi-delivery addresses option PrestaShop now can power any size of business with numerous stores worldwide. Vital upgrades were also made in product management system. For instance, you will be able to create packages of different downloadable items (photos, music, software, etc.) and sell them all together. Uploading speed was also increased which means you can minimize your time spending for product uploading procedure. 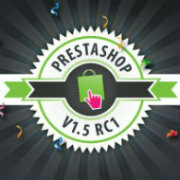 With new PrestaShop 1.5 marketing tools you will be able to offer your clients discounts on store items. You can give discounts depending on the customer’s group, country or even brand. You can set any type of pricing rules that will be applied automatically. PrestaShop team didn’t forget about SEO features. For example, to achieve maximum possible ranking in search engines all links will now be built by configurable URL rewriting. The final touch of new PrestaShop version is definitely its rewritten core. Now it meets the MVC pattern and even easier way for Internet merchant to create a web store.